White House counselor Kellyanne Conway and CNN's Brian Stelter sparred during an interview Sunday morning on "Reliable Sources." 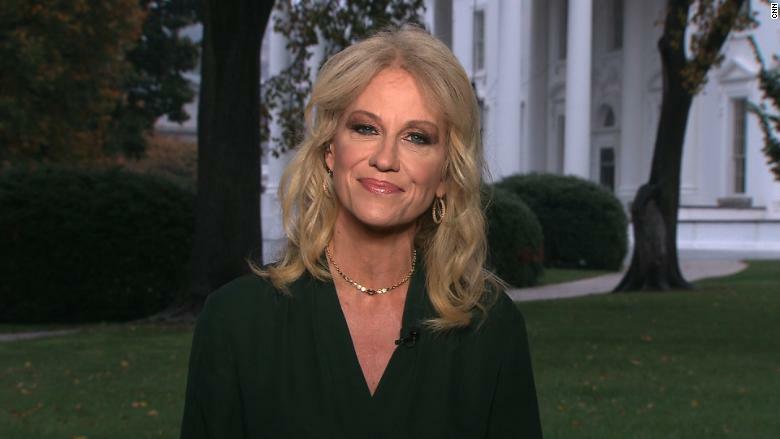 Conway, who worked on President Trump's campaign and now serves as a top adviser, joined Stelter on air for the first time since July. The interview began when Stelter addressed what he called Trump's "credibility crisis." He pointed to a new Washington Post-ABC News poll that suggests only 33% of Americans think Trump is honest and trustworthy, while 65% do not. Conway called it "hyperbolic." She immediately turned to the "the numbers that matter to Americans" -- low unemployment rates, climbing consumer confidence and record stock market highs. She then attacked the credibility of reporting that is critical of the president and accused CNN of being "anti-Trump." "We're not anti-Trump, Kellyanne," Stelter responded. "We're pro-truth. We are pro-honesty. We're pro-decency." Stelter responded. Stelter then asked about Trump's stated disappointment with the Department of Justice amid new developments in special counsel Robert Mueller's Russia investigation. Conway turned attention toward Hillary Clinton's connection to the infamous dossier of allegations about Trump and Russia. "CNN itself has been so hot on Russia, Russia, Russia, on the dossier," she said. "Now that we know the [Democratic National Committee] and the Clinton campaign paid the same firm for said dossier, which is completely unverified, we can't get you excited." Stelter pointed out that portions of the document have, in fact, been verified. "That is misinformation that you're spreading on my program," he said. Stelter also pressed Conway on whether Trump has any involvement in the review of the pending AT&T acquisition of Time Warner, which is CNN's parent company. The Wall Street Journal reported last week that the Justice Department is weighing whether to sue to stop the deal. Trump had vowed to block it during his campaign. Conway claimed Stelter was spreading "poison." She insisted that the White House would not interfere with the merger. Stelter also asked about whether Trump had filed his federal tax returns. The deadline for doing so after asking for an extension was last month. "You know what his tax returns might look like in the future? A postcard," she said -- a reference to the Republican pledge to simplify the tax code.